Fulbright scholars from Argentina arrive at UNH. 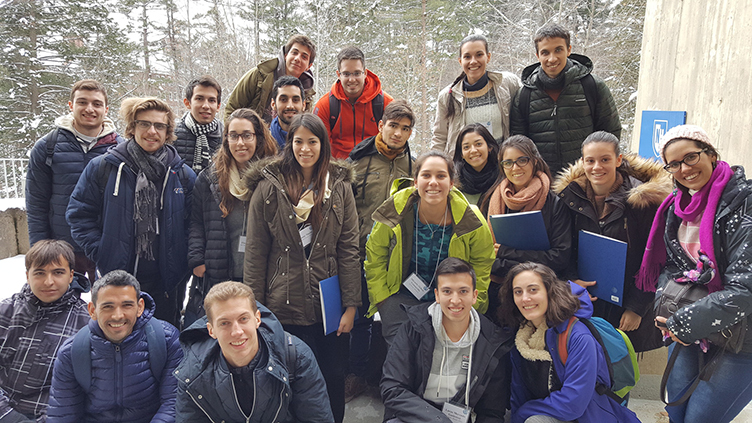 A group of undergraduates from Argentina are on campus for a six-week immersion program that will offer a crash course on life in America, thanks to a competitive grant UNH received from the Friends of Fulbright Scholarship. The 21 Fulbright students, who have a firm foundation in English, will attend classes, eat in the dining halls, live in the dorms and pair one-on-one with UNH students. The international exchange was arranged through UNH’s Global Education Center (formerly CIEGE, the Center for International Education and Global Engagement). The center collaborated with academic and residential life colleagues to develop a program aimed at strengthening the Argentine students’ knowledge of American culture and higher education in the United States. Students are taking two classes of their choice as well as a required course through the ESL Institute and the course “Latin American Civilization and Culture,” which will have them partner with UNH students on a research project. The Argentine students are older, between 20-24, and well into their majors. As a result, they were steered toward taking 600- and 700-level classes. Because the students aren’t here for a full semester, Kerryellen Vroman, interim associate vice provost for international programs, approached deans and faculty members to see if the students could do short-term audits of their chosen classes. “One-hundred percent of the faculty were excited to have an Argentine student in their class,” Orifici says. In addition to visiting Boston and New York, the Office of International Students and Scholars has planned numerous activities for the Fulbright scholars, including attending UNH hockey and basketball games, a trip to Concord, skiing, full-moon snowshoeing, an outing to the UNH Observatory and shopping in Freeport, Maine. The students arrived on campus Jan. 18 and will be here through March 9. Want to know how you can study abroad? Find information here.